What’s Thanksgiving Without the Pie!? There’s no need to bake this Thanksgiving holiday. All that precise measuring?! Leave it to the pastry chefs! The amazing bakeries here in NYC have got you covered from traditional pumpkin, apple and pecan to unique ideas like a giant chocolate turkey. There are also delicacies for your breakfast while you watch the parade or for day-after slothing. Read the roundup below to find your perfect sweet treat. And if you’re not hosting, pies also make a great gift for your hosts. Bubby means grandmother in Yiddish so you know this place will have you covered in the ‘comfort pie’ department. They have traditional pumpkin and pecan, as well as interesting choices like sour cherry and key lime. Our pick would be the Apple Whiskey Crumble – an after dinner dessert to die for. There are two convenient locations – Tribeca and near the Highline! This iconic NYC bakery has locations all over the city, including the West Village and inside Chelsea Market. Amy’s has got you covered in the bread department, of course (pumpkin walnut cranberry bread – swoon). They also have a ‘special’ pumpkin pie – made with love and tons of flavor, as well as an apple crumb pie. Don’t forget to pick up an apple pecan coffee cake or a pumpkin pecan knot – perfect for breakfast or as a beautiful addition to the Thanksgiving table. Located in Soho and the West Village. A French bakery offering up unique twists on traditional desserts. Their pumpkin pie is billed as ‘extra silky’ – I’m daydreaming about the taste now. 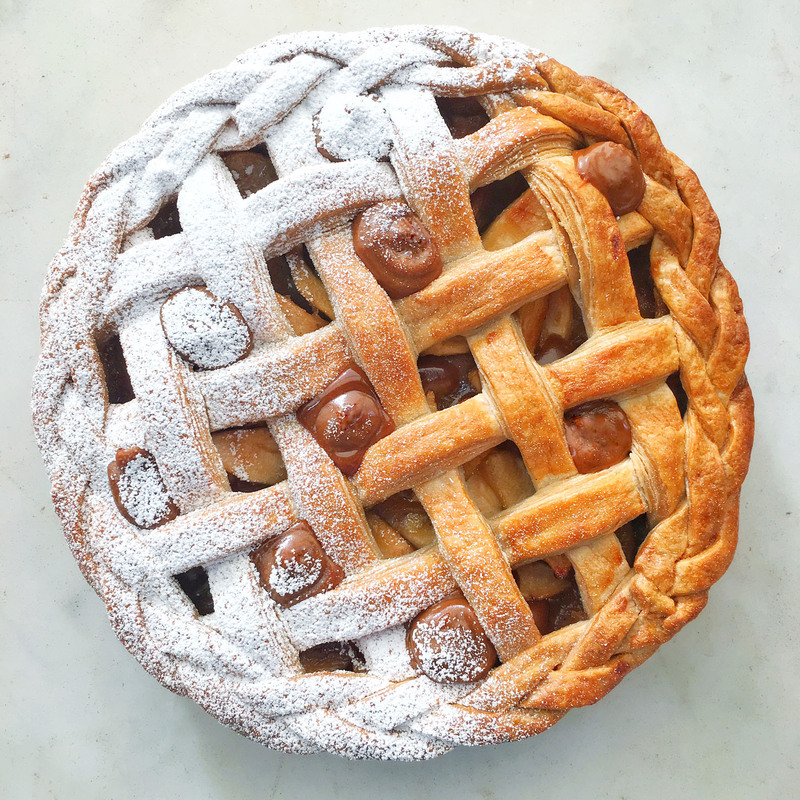 Or try their spin on traditional apple pie – the salted caramel apple pie. The bourbon pecan pie is sure to be a hit as well. This baker does not do anything halfway – people will be singing your praises if you come with an Ansel pie! And we’d be remiss not to give a special shout-out to the perfect gift for your host or hostess. A true show-stopper and possibly even the centerpiece for the Thanksgiving table. A giant chocolate turkey from Li-lac Chocolates, 17 inches tall and 14 lbs! Should be enough to send all your guests off in a happy chocolate haze. Locations in the West Village and Chelsea Market.